Ilker was a very knowledgeable and accommodating guide. We would recommend him without reservation to anyone who is visiting the region. TOUR GUIDE RESPONSE: Thank you so much for taking your time for your generous review. Ilker is knowledgeable, thoughtful and considerate. He knew that my mother gets car sick easily so he arranged a big van for us during our trip to Ephesus and Pamukkale! He knew we love seafood so he took us to a delicious seafood restaurant overlooking the Agean Sea! He is flexible and took us to so many places on our request. I told him I would like to visit a winery on the way back from Ephesus and he took us to pythagoras vineyard! Prior to the trip, he offered to help arrange everything! TOUR GUIDE RESPONSE: Dear Pew, thank you so much for taking your time to write this generous review. Hoping you come again and meet you for other destinations in Turkey. Ilker planned a wonderful day for my family, meeting our Silver Sea cruise ship at the Marmaris port. From the day I booked, he asked what we were interested in, and he arranged a great day that fulfilled all our expectations and more! We visited a honey bee museum (great for kids), bought beautiful handmade Turkish pottery, drove to a quant seaside village for a FABULOUS lunch (most memorable of our entire Greek/Turkey trip), and a brief tour of Marmaris. Ilker is professional, friendly and recommended! TOUR GUIDE RESPONSE: Thank you so much for taking your time for writing this review. I really enjoyed your company, too. Looking forward to meeting you, your parents and wonderful twin daughters again for an other occasion. We couldn't have asked for a better experience in Ephesus. Ilker was wonderful, spoke English very well, had a wonderful understanding of what we would like to learn of the area and the vehicle and driver were great. It has a seat the turns around so that he is looking at the passengers while he is explaining things. Also, we stopped for an unbelievable lunch. TOUR GUIDE RESPONSE: Thank you Nancy hoping to guide your party again at another occasion. One of the best tours ever. We are a family of five with three kids. Ilker was an extraordinary guide, he helped me create a custom itinerary to match our interest and time. His english is fluent, his knowledge is excellent and he was extremely patient with many of my questions and photo-taking. He went above and beyond to assist me with additional requests. When I return, I will book him again. We'd highly recommend hiring him as a guide. TOUR GUIDE RESPONSE: Thank you for taking your time to write this review. It was great to meet you and your lovely family. I hope to meet you again for enjoying other parts of beautiful Turkey soon. What a fortuitous find with a week to spare before arriving in Bodrum! ILker's engaging personality and command of English made the tour an enlightening experience. His bountiful knowledge of the history of Ephesis / House of The Virgin Mary enriched the experience to that of being more than just a tour but a true journey back in time. Ilker also has a network of Producers including carpet weavers and ceramic makers who are world-class craftsmen! Thank you for one of our top-two experiences in Turkey! TOUR GUIDE RESPONSE: Thank you very much for your kind contribution. Ilker managed to visit major tourist sites at the best time to avoid the large tour buses and chose to show local aspect unhurried, such as interesting and relaxing time for a Turkish Coffee in the main square to observe the local domino games. TOUR GUIDE RESPONSE: Thank you for taking your time to write this commend. It was a last minute tour set up and difficult to get nailed down. The actual tour sites were beautiful to see but we did not feel we got a great deal of information. Some of the sites seemed cursory at best. Ilker has a unique perspective and showed us some great local places that were not part of the tour. We booked Ilker for two days of private tours The day in Bodrum was the second day. Our second day was even more enjoyable as the first day. Ilker was professional, yet friendly, and was very willing to adjust the day's schedule to fit our interests. Over our 11 day cruise, we had tours through the cruise line, through private group tours, and the two days booked with Ilker through Tours by Locals. As we are at the end of our cruise, my husband and I agree that our favorite tours were with Ilker! Excellent tour day. Ilker was waiting for us as we disembarked from our cruise ship. He was friendly, knowledgeable, and prepared to show us all the highlights of Ephesus and other sights of Kusadasi. We had some areas of interest in addition to those typically covered on the tour and he was very obliging in adjusting the schedule to accommodate us. His knowledge of both history and of current events was so impressive. We would highly recommend him as a tour guide! TOUR GUIDE RESPONSE: Thank you so much for taking your time to review your 2 day experience with me in Turkey. I am looking forward to meeting you again. TOUR GUIDE RESPONSE: Thank you for taking your time for writing this message. Kusadasi's Ephesus Private Tour was the best of the best. WE had three excellent Tours by Locals but Ilker was the best of them all. In addition to seeing the ancient sights of Ephesus, he took us to a local carpet shop, not a factory and the owners had dinner for us: traditional Turkish food and showed us how they make beautiful carpets...highly recommend the experience. It made us love Turkey in-spite of our fears being high as we went to Istanbul the next day, two days after a bombing there. TOUR GUIDE RESPONSE: Thank you for honoring, it was a pleasure. The two days that we spent with Ilker were extremely educational. Besides the usual sites he took us off the beaten path where we could interact with local residents and learn about Turkey it's history and culture. He is very knowledgable and able to communicate that knowledge. The time spent with him was the most valuable investment we made on our tour of Europe. TOUR GUIDE RESPONSE: Thank you so much for sharing your feelings with future travelers. 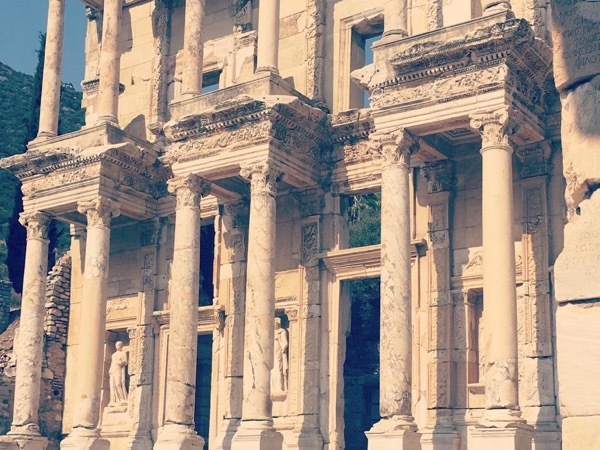 It was the total consensus of our group that Ilker was a highly focused guide providing depth to the history of Ephesus; and wonderful side stops to provide cultural context to the region. He was so personable and really made the day an awesome experience. TOUR GUIDE RESPONSE: Thank you so much for the total consensus and kindness. Ilker was an excellent guide and man. He talked to us about Turkish life and showed us the best sights in and around Ephesus. His English and knowledge are superb. We felt like family and friends rather than tourists. I would recommend him for any size tour. We hope to see Ilker again. TOUR GUIDE RESPONSE: Thank you so much for taking time to review the tour such a positive way, I would like to meet you again soon. TOUR GUIDE RESPONSE: Thank you for your contribution Barry. My wife and I were very satisfied with our tour. Iker is very personable and knows his history. Would recommend without hesitation. TOUR GUIDE RESPONSE: Thank you for taking your time to write a commend. I would like to thank Ilke for a wonderful day visiting these 3 fascinating sites, we had a great day with him and learned a tremendous amount about Turkey's history and culture. both ancient and current. We especially loved the stop for lunch and meeting the owner of the property it was a unique experience. Ilke was both informative and made everything very interesting. I would not hestitate to recommend him as a guide. Definitely 5 stars. Thank you. TOUR GUIDE RESPONSE: Thank you very much for your correspondence. Ilker was a nice person. He maintained contact with us up to the time of the tour. He was very knowledgeable and we felt we got true value for the price paid. He took us to all the main tourist sites and avoided the crowds while doing so. He took us shopping, which turned up some good results. The only thing I would say is we could have skipped the leather shop and spent a little more time at the historical stops later in the day. Highly recommend otherwise. TOUR GUIDE RESPONSE: Thank you for taking your time to write this review. TOUR GUIDE RESPONSE: Thank you Dear Cyril for your appreciation. TOUR GUIDE RESPONSE: Thank you so much for your feedback. We enjoyed our tour with Ilker. He is very knowledgable and showed up the sites. We were happy to see the 'touristy' areas along with many less traveled areas. It was a terrific day visiting Kusadasi and Ephesus! TOUR GUIDE RESPONSE: Thank you, hope to show you other parts of my beautiful country! Ilker was excellent. He speaks English very well. He is kind, charming, very knowledgeable, and passionate about what he does. He managed to weave us in and out of the crowds at Ephesus and brought the city to life for us. He gave good advice about how we should spend our time. We had a wonderful and entertaining lunch very nearby, hosted by the owner of a farm that had been in the family for six generations. Ilker made this a pleasurable and authentic experience that we won't soon forget. Ilker was excellent. He speaks English very well. He is kind, charming, professional, very knowledgeable, and most importantly, passionate about what he does. He adapted our day to fit the needs of our group (which was a bit challenging). Lunch was also a highlight, where we received a guided tour of the menu at an authentic local restaurant. Ilker demonstrated his integrity by the way he resolved a minor issue that arose due to some miscommunication. I recommend Ilker without reservation. TOUR GUIDE RESPONSE: Thank you for the feedback, wishing to meet you again in Turkey. My party of 10 all thoroughly enjoyed Ilker as a tour guide! He arranged for a large, air-conditioned vehicle which comfortably accommodated our group. His vast knowledge of Ephesus/Turkey allowed him to provide us with lots of interesting info both while driving between attractions, as well as when visiting each one. He was able to hold the interest of the three teenage boys in our group. He also selected a fabulous location for us to have a Turkish lunch - which was delicious! Highly recommended!! TOUR GUIDE RESPONSE: Thank you so much for your contribution, best regards! Ilker gave us a WONDERFUL tour to multiple interesting and scenic sites. The tour was well organized, and Ilker enhanced the experience with valuable commentary along the way. This was an OUTSTANDING experience for us. Ilker showed us Ephesus and the house of Mary. We went to a carpet mill and had an excellent talk about carpet making and bought a beautiful one for our house. Had a lovely lunch with typical Turkish food al fresco in the garden. The Aquapark was fantastic and a welcome relaxing break in the summer heat. A short trip to the temple of Artemis followed. Managed to get a lovely experience of this great place in this day thanks to Ilker. Excellent guide. TOUR GUIDE RESPONSE: Thank you for your great contribution.Best Regards! This was the best, because I told Ilker we wanted a prívate tour. Just me and my family, so he gave the best Izmir had to offer. It is very nice to explore a city with a guide that tou can tell what you want to do. We did not want to go to Ephesus , because we had been there before. But I know Ilker would be the best guide to visit the ruins. It was very interesting because he knows about history, economy, politics, culture. I really recommend him. TOUR GUIDE RESPONSE: Dear Ana, thank you for taking your time and writing the review. Hope to see you again soon. TOUR GUIDE RESPONSE: Thank you very much for your commend!.. Ilker was an excellent and informed guide and made our tour interesting, colourful and diverse - a great experience! TOUR GUIDE RESPONSE: Thank you so much for remembering and this review after so much time. Ilker did a great job - we'd like to work with him again. Ilker is very knowledgable about the history of each site, and makes sure his guests feel comfortable. We love local food, and he took us to some fabulous out of the way spots we would never have found on our own. At the end of our tour, we had a small crisis - our return flight out of Izmir was canceled due to weather. Ilker assisted us in rebooking the next flight - without his help, we'd have had major problems communicating with the airline. TOUR GUIDE RESPONSE: Thank you Mrs Warner. It was great to meet you. Ilker was a terrific, knowledgeable guide who went above & beyond our expectations to show us his country! We spent the morning touring the Ephesus sights -- the Terrace Houses were especially impressive! Ilker chose a wonderful local restaurant for lunch. In the afternoon Jim tried his hand at ceramics & helped pull some silk at the rug co-operative -- we would never have found these opportunities on our own. We would highly recommend Ilker; it is easy to see he loves his country & wants to share it! TOUR GUIDE RESPONSE: Dear Lucie, Thanks alot for your lovely commend. Ilker arranged everything perfectly and was very adaptable to what we wanted to see, etc. I highly recommend this tour! Ilker was absolutely the best, very accommodating, we did everything we wanted. Showed us some out of the normal places! Thank you so much. Turkish fairy tale! We are especially thankful to Ilker for encouraging us to make this tour. It was a long way to drive but he was, nevertheless, brave enough to suggest it. And it was great! Fantastic place. Entertaining and informative tour. Nice city. Good tour. Could be a tiny bit more informative. Ilker is very accomodating and knowledgeable about his country. He took us on a tour to Cherry town and that area since we had already been to Ephesus. His English is excellent and always tries to give you the local flavor, whatever area he takes you to. Would definitely recommend his services! Ilker was great!! He showed up early and was very accommodating to our schedule. He went the extra mile of providing a large van (even though we were only a group of 4) and cold drinks which was much appreciated. He took us to some great restaurants and we would highly recommend his services you will not be disappointed. Ilker is very knowledgeable, extremely personable & always willing to tailor the excursion to include your suggestions and priorities. He is very careful to monitor the time so everything gets included. Would recommend him without question. This was 1st of 2 days with Ilker, & he proved to be totally professional in all respects. His knowledge is impeccable as is his thoroughness and desire to please. He went out of his way to include all of our requests, including no shopping stops. He was responsible for 2 exceptional day trips. Ilker did a fantastic job guiding us. We were a group of six with a day in Ephesus while on a cruise. Ilker was personable, knowledgeable and flexible. In touring the ruins, he suggested we pay extra to go through a better-preserved section and that was very good advice. He was knowledgeable about the scriptural aspects of Mary's House, which was important to us. And he steered us well in taking us to lunch and for a baklava break. Altogether, a great day.